A report last week revealed the upcoming episode would play out on a Mac OS X desktop -- created from scratch by the show's graphics team -- used by Claire Dunphy (Julie Bowen), who is attempting to find her daughter Haley (Sarah Hyland) while stuck in an airport in Chicago. 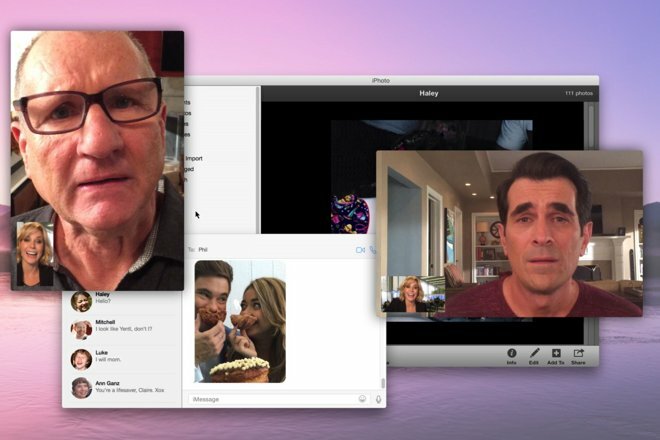 Throughout the show, Dunphy uses FaceTime and iMessage, among other apps, to remotely connect with her family back home in Los Angeles. I'm willing to bet this is not the only case of this. There's a reason almost every top camera on Flickr is an iPhone. 1) I wonder which shows that have been shot with an iPhone. I think it was when John Oliver was filling in for Jon Stewart on "The Daily Show" last Summer than there was a power outage and so they did part of the show on an iPhone, but that's all I can think of, and even that I am not certain. 2) Remember when the iPhone first appeared on TV shows (about a year after in launched due to standard filming and distribution times), and usually the actors were holding them upside down, which I assume was on purpose, for reasons I can't really fathom. 3) So far I haven't read anything that says Apple paid for this sort of novelty that focuses on their products. My guess is it A) made for an interesting and funny idea since families do you "chat" with each other remotely, and actually using Apple's equipment will get a lot of free press for the episode which would have been lost if they used Skype and AIM, or simply made up a service like ChatBox or FacePalm, which shows that Apple's mindshare is massive. I'd say because it's a very convenient camera, more so than anything. I'm not saying it's a bad camera — far from it — but in terms of great cameras it's going to be very low on the list if we include professional cameras, hence my usage of convenience. The question I have isn't why is the iPhone a smartphone camera so high on the list, but why isn't snapshots from Android-based devices higher, even besting iOS-based photos? I think it's because ????????????????????????????????????????????????????????????????. Megapixels. It's all about them megapixels. My guess is that the early iPhones had some sort of idiosyncrasy regarding the display, either some sort of frame synchronization issue or possibly some sort of screen polarization that prevented TV cameras at the time from effectively filming the iPhone screen. If I wear some polarized sunglasses in my car, I find it hard to read certain LCD elements on my dashboard like the clock. Same issue with many iPods, the LCD screen would go black if I viewed them at a certain angle with some polarized glasses. Could be something like that. Imagine if you could use the 41 megapixel sensor of the lumia 1020? I'd take it in a heart beat with Apple's lightening quick ISP, especially if they keep RAW. It really is a fantastic sensor. Prepping my photos for Photos and iCloud, it is amazing to see such a marked difference in the photos taken across the iPhone generations, from the first one to the 6 Plus. I used to think that the iPhone 4 photos seemed good enough, but then the 5, 5s and now the 6 Plus, are so much better. When we go for holidays or have to cover some events, we always carry a Nikon along for better resolution photos, but the iPhones over the years captured almost all the historic memories we have of our kids growing up. Of course, I guess that it true for any smartphone User. I've used the iPhone almost exclusively over the years so my perspective is limited. The phone I had before the iPhone was a Sony Ericsson with an amazing camera that could take pics at a super resolution of 1 Megapixel! Honestly, if it wasn't for the iPhone, I would have continued using Sony phones. Remember when people used to say that once digital cameras crossed the one megapixel barrier it was game over for traditional film cameras? Well, it took a bit longer, but there definitely has been a passing of the torch. Who gets the most credit here for the iPhone camera? Is it Sony for presumably designing and building the camera HW, or is it Apple for creating the SW that make it a better experience than from other smartphone OEMs? I'd say it's Apple for making such a popular and high quality product. All these model shoots and videos done with mobile products are a bit silly, although I can see how it helps from a marketing sense. Photography has always been about light, not cameras. Granted, it has to be good enough, and many smartphones aren't really. That said, in any situation where the iPhone's focal length, DoF, and light sensitivity are good, then the photos will be about as good as the best cameras in the world (lens quality may challenge though). Throw some good support and lighting into the equation, and it gets even more versatile. My Nexus 4 had a decidedly mediocre camera, but I still won some magazine photo contests with it, because the lighting was right, the camera is adequate, and I composed the shots thoughtfully. First, I think Apple gets credit for the camera in the iPhone, regardless of the component manufacturer. There are multiple camera modules, sensor modules, etc. available to smartphone manufacturers, so the credit goes to the people who selected a high quality components. The camera module is actually a pretty pricey component, so smartphone manufacturers can cheapen out and go for a less pricey and likely less capable part. Of course, without great hardware, it would be hard to have a decent initial image. Garbage in, garbage out. The early-phase prototypes of the iPhone don't run the full-blown operating system with all the apps, bells and whistles, all the APIs fully functional. They run a bunch of test programs. That means at a base level, you need to make sure that the hardware is okay, or in Apple's case, provides great quality base images. Apple's iOS team is also commended for software that the user interacts with, since users don't actually manually adjust the hardware. Personally, I think there are third-party apps that provide more functionality than the iPhone's native Camera app, but again, credit should go to the iOS team for offering developers a strong photo API to interact with the hardware. Remember, an operating system is a big complicated program that lets other big complicated programs run together in harmony on the same system: music players, video conferencing, camera apps, weather, GPS, audio calls, SMS, gaming, whatever. You can have great hardware and a lousy operating system (Windows ME was a classic example). It's not just about having a good built-in camera app, it's also about providing good support for developers who wish to write their own camera apps. Sony can take a bow this year for providing a nice part, but if next year Apple selects a different component provider, then Sony sits down and someone else takes a bow. To the consumer, it really doesn't matter whose name is stamped on which part inside the smartphone. But Apple is the one calling the shots here. That much is clear. If you haven't already, go to the iTunes Store and look up Modern Family. The entire 4 minute clip on the behind the scenes shooting of Connection Lost is free to download, and very interesting to watch. I've never watched this show, not one time, but for 2.99 an episode, I will buy this one. It's not just because it's done with with Macs, iPads and iPhones, but because of the creative efforts put forth by the Modern Family team to recreate what consumers take for granted. I'm a big fan of how television works behind the scenes, there is a lot of talented work behind it. Remember when people used to say that once digital cameras crossed the one megapixel barrier it was game over for traditional film cameras? Let's be clear here... It was the 12 megapixel barrier—that was the magic number speculated where CCD's could really kill 35mm film (based on the pixel count and resolution calculated from a 35mm equivalent)—not 1 megapixel. Respect to the history of street shooters and 35mm film. 1 megapixel... I wouldn't get out of bed for that. I don't know how old you are, but early digital cameras set 1 MP as a high water mark for some length of time. Remember, we didn't get to where we are now without a lot of painfully slow advances. How did Claire set her spotlight so typing in 'facebook' or some term she wants to search for automatically jumps to Safari and goes to the respective site? Yes you can do that in multiple ways, although the lack of results population as she typed is not accurate.